Due to popular demand we sold out our 1st week so we’ve added a 2nd week! Book now to get your choice of cabins before we sell out! The American Sailing Association has partnered with the yacht Arabella to offer exclusive and discounted sailing vacations this summer. 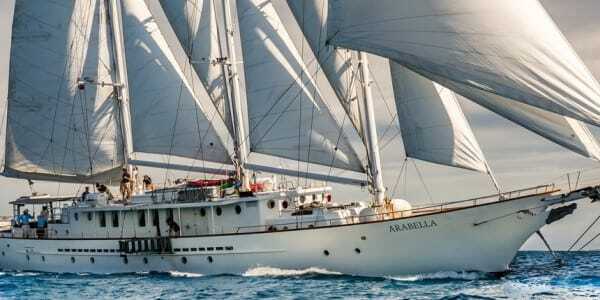 Arabella is one of the most beautiful sailing yachts in our country. She epitomizes classic elegance and graceful style. Arabella has been an icon along the East Coast in summer and in the Caribbean in winter. She has hosted thousands of guests, provided incredible sailing experiences and created lifetime memories. Not only is Arabella a luxurious mega yacht, but she is also an incredible sailing vessel. The captain & crew love to hoist the sails, turn off the engine and feather the prop. Then Arabella really performs her magic as she slices through the water powered by the wind. Everyone deserves this type of mega yacht sailing experience at some point in their lives. Arabella was built by Palmer Johnson in the 1980s for a famous movie actress who sailed her across the Atlantic Ocean. In the late 1990s, she was purchased by two hotel entrepreneurs from Newport, RI. They lengthened her to 157 feet and converted her into a sumptuous floating hotel. During this rebuild, Arabella also became US Coast Guard certified, one of the few mega yachts with this designation in our country. Join us on our Grand Tour of New England, not as a tourist, but as an exclusive guest onboard a mega yacht! This summer, Arabella visits the big three – Newport, Nantucket & Martha’s Vineyard. These are absolutely the BEST vacation spots on the East Coast. This is where the President, movie stars and moguls go to hang out, hide and relax. This itinerary is only an example. All stops are subject to the captain’s discretion and may vary due to weather or unforeseen circumstances. Guests will be able to drop their luggage off at a specified location starting at noon to give more time for exploring fabulous Newport. Guests will begin boarding the Arabella at 3pm in historic downtown Newport harbor. Newport is the sailing capital of our country and this is where the America’s Cup Races were held until 1983. The Captain will invite all guests for a “Welcome Aboard Cocktail” on the deck, afterwards guests may go ashore for a night on the town with dinner at one of the many amazing Newport restaurants. Morning begins with a splendid departure from Newport. We then shake out our canvas and sail over to Martha’s Vineyard. On the “Vineyard,” we will anchor off Edgartown. You can spend the afternoon on the beach or take an island tour. You can also taxi over to Oak Bluffs which is a quaint Victorian village known for its gingerbread houses, eclectic restaurants and Presidential visits. Dinghy back to the Arabella early evening for cocktails and dinner aboard. This morning begins with an exhilarating sail to Nantucket, the historic island 30 miles out to sea. Nantucket was once the world’s center of the whaling industry and is still largely undeveloped and true to its roots. You can take the launch to a pristine secluded beach or explore in one of our kayaks. There is a Whaling Museum on Broad Street. It originally was a factory for refining whale oil and exhibits all the tools of the trade including a full sized whale skeleton and an incredible collection of scrimshaw. You can also enjoy the fine shopping along the cobblestoned streets of Nantucket’s 19th century downtown. We will sail back to Edgartown on Martha’s Vineyard. Be sure to pay your respects at the Edgartown Yacht Club which hosts prestigious regattas every summer. You can explore more, go to the beach or visit Chappaquiddick Island and the Cape Pogue Wildlife Refuge. It`s a great place for an invigorating hike. You can also visit the Felix Neck Wildlife Sanctuary, a 200 acre tract owned and operated by the Massachusetts Audubon Society. In the summer nature trails are ripe with blueberry, blackberry and beach plums. After rising to a beautiful sunrise and hearty breakfast, we will weigh anchor and set sail for the enchanting island of Cuttyhunk. This jewel of the Elizabethan Islands has one of the most picturesque harbors in all of New England. The evening will find us on the beach for a real New England lobster bake, complete with all the trimmings included in your fare. We set sail in the morning and return to Newport late morning/early afternoon. Enjoy breakfast with your shipmates on your final day under Arabella’s billowing sails. After your grand entrance to Newport Harbor, you will disembark by 4pm. If your schedule permits, you can spend more time in Newport to visit the mansions, sail on an America’s Cup 12 Meter, ride the Rum Runner at sunset and party like a sailor. Sailing enthusiasts may want to book a spot to sail on one of the historic America’s Cup 12 Meter yachts which do day sails out of Newport. The Museum of Yachting is also located in Fort Adams State Park and exhibits much of Newport’s storied yachting history. 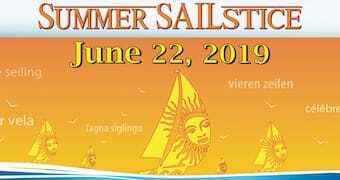 ASA Members are entitled to special pricing for this once in a lifetime sailing vacation adventure.